The Interfaith Scholar Weekend Speaker for February 2015 will be Rev. Dr. Miguel A. De La Torre, Professor of Social Ethics and Latino/a Studies at the Iliff School of Theology in Denver, Colorado. His topic is: “Our Immigration Dilemma”. 18), De La Torre dissolved his thirteen-year-old firm and attended Southern Baptist Theological Seminary in order to obtain a Masters in Divinity. a social scientific approach to Latino/a religiosity within this country, Liberation theologies in the Caribbean and Latin America, and postmodern/postcolonial social theory. Since obtaining his doctorate in 1999, Dr. Miguel De La Torre has authored numerous articles and over thirty books, including the award-winning Reading the Bible from the Margins (Orbis, 2002); Encyclopedia on Hispanic American Religious Growing Religion in America (Wm. B. Eerdmans, 2004); and Doing Christian Ethics from the Margins (Orbis, 2004). He presently serves as Professor of Social Ethics and Latino Studies at Iliff School of Theology in Denver. Within the academy, he is a past director of the American Academy of Religion and 2012 President of the Society of Christian Ethics. 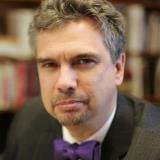 Additionally, he is editor of the Journal of Race, Ethnicity, and Religion (www.raceandreligion.com). A scholar-activist, Dr. De La Torre has written numerous articles in popular media and has served in several civic organizations.